There’s a great game of capture-the-flag that takes place every year at HITCON. This isn’t your childhood neighborhood’s capture-the-flag in the woods with real flags, though. In this game the flags are on secured servers and it’s the other team’s mission to break into the servers in whatever way they can to capture the flag. This year, though, the creators of the game devised a new scoreboard for keeping track of the game: a lightsaber. In this particular game, each team has a server that they have to defend. At the same time, each team attempts to gain access to the other’s server. This project uses a lightsaber stand that turns the lightsabers into scoreboards for the competition at the 2015 Hacks In Taiwan Conference. It uses a cheap OpenWRT Linux Wi-Fi/Ethernet development board, LinkIt Smart 7688 which communicates with a server. Whenever a point is scored, the lightsaber illuminates and a sound effect is played. The lightsabers themselves are sourced from a Taiwanese lightsabersmith and are impressive pieces of technology on their own. As a bonus the teams will get to take them home with them. While we doubt that this is more forced product integration advertisement from Disney, it certainly fits in with the theme of the game. Capture-the-flag contests like this are great ways to learn about cyber security and how to defend your own equipment from real-world attacks. There are other games going on all around the world if you’re looking to get in on the action. There are numerous instances where we need to know our location, but cannot do so due to GPS / GSM signals being unavailable and/or unreachable on our Smart Phones. [Blecky] is working on SubPos to solve this problem. It’s a WiFi-based positioning system that can be used where GPS can’t. SubPos does not need expensive licensing, specialized hardware, laborious area profiling or reliance on data connectivity (connection to database/cellphone coverage). It works independently of, or alongside, GPS/Wi-Fi Positioning Systems (WPS)/Indoor Positioning Systems (IPS) as an additional positioning data source by exploiting hardware commonly available. As long as SubPos nodes are populated, all a user wishing to determine their location underground or indoors needs to do is use a Wi-Fi receiver. This can be useful in places such as metro lines, shopping malls, car parks, art galleries or conference centers – essentially anyplace GPS doesn’t penetrate. SubPos defines an accurate method for subterranean positioning in different environments by exploiting all the capabilities of Wi-Fi. SubPos Nodes or existing Wi-Fi access points are used to transmit encoded information in a standard Wi-Fi beacon frame which is then used for position triangulation. The SubPos Nodes operate much like GPS satellites, except that instead of using precise timing to calculate distance between a transmitter and receiver, SubPos uses coded transmitter information as well as the client’s received signal strength. Watch a demo video after the break. 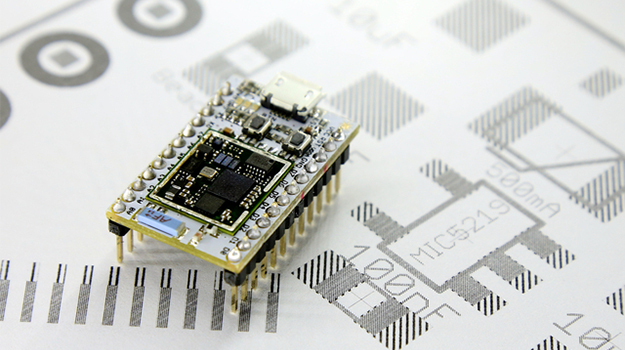 Most Hackaday readers may remember the Spark Core, an Arduino-compatible, Wi-Fi enabled, cloud-powered development platform. Its Kickstarter campaign funding goal was 10k, but it ended up getting more than half a million. The founder and CEO of Spark [Zach Supalla] recently published an article explaining why Kickstarter projects are always delayed as the Spark core project currently is 7 weeks behind schedule. [Zach] starts off by mentioning that most founders are optimistic, making them want to embark in this kind of adventure in the first place. In most presentation videos the prototypes shown are usually rougher than they appear, allowing the presenters to skip over the unfinished bits. Moreover, the transition from prototype to “manufacturable product ” also adds unexpected delays. For example, if a product has a plastic casing it is very easy to 3D print the prototype but much harder to setup a plastic injection system. Last, sourcing the components may get tricky as in the case of Spark core the quantities were quite important. Oddly enough, it was very hard for them to get the sparkcore CC3000 Wifi module.